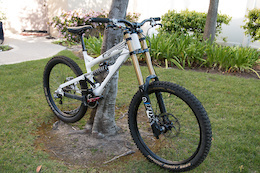 Buyer Pays Shipping 2014 Santa Cruz V10 Carbon Size Med. This bike was built with the best and ridden very little. Parts are as follows: Fork - Fox 40 Wheels - DT240 Hubs on Carbon Lite Bicycle rims Tires - Schwalbe Big Betty F/R Tubeless Cranks - Carbon RaceFace Ring - RaceFace Bars/Stem - Pro Atherton Shifting - Shimano Saint Breaks - Shimano Saint Seat/Seatpost - SDG I-Beam Grips - ODI Lock-On Ruffian MX Comes with (Photos added soon) - Fox Coil and Fox X2 rear shocks, and two extra springs. One Ti and one Steel. Selling this bike for a friend. This is a custom painted 2018 Intense Carbine size Medium. The bike was built last year and has a handful of rides on it. Bike is in near new condition. There are some scratches in the paint on the rear triangle. on the larger size of medium. Rider is 5'11" tall. Custom Build as follows: Fork: DVO Diamond 29 Rear Shock: Rock Shox Super Deluxe w/DVO Badging Wheels: Speed 29 Mau/TR29 Bar Stem: Enve Minnar 2 780mm wide / Enve Carbon Stem 40mm Brakes: Shimano XTR Shifting/Cranks: SRAM 11sp XO Seat Post: Crank Bros Highline Tires: ONZA Grips/Saddle: Ergon Price of bike includes shipping. Prefer local sale Only contact if serious. 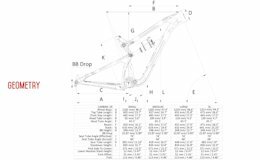 Is this frame still available? Interested Buyer here.